When I was growing up sitting down together for a meal was something that we did every evening. Same time, same place. Together as a family we ate dinner and talked about our days. Today, I still do that with my family because I feel that it’s important to stay connected and have that time set aside to be together in person, especially when there is so much going on in everyone’s lives and we tend to rely on technology to communicate with one another. I’m not alone in this either. Welch’s feels the same way & have a new campaign called Share Your Moments! Welch’s believes in the magic of “kitchen table” moments, and has been helping families enjoy them for generations. In the time it takes to drink a glass of juice or share a sandwich, a special moment can happen. 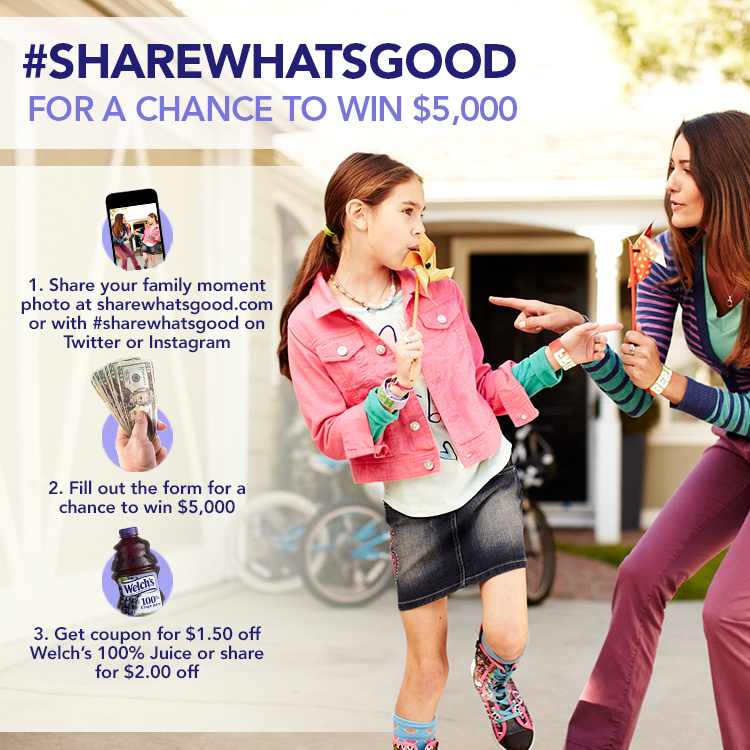 That’s why Welch’s just launched a new movement called “Share what’s good™” It’s all about sharing those special moments that occur each day with family, friends and loved ones – whether it’s at home or on the go. At Sharewhatsgood.com you’ll find a variety of great content from fun family ideas to delicious recipes. You can share photos of your every-day moments and see how others are doing the same. As part of the Share what’s good campaign, Welch’s has launched the “Share Your Moments” photo contest! From 9/16 to 10/25 upload a photo of your favorite family moment for a chance to win $5,000! While there is only one grand prize, everyone who enters will get a $1.50 coupon for Welch’s 100% Grape Juice – or $2.00 if you share the news. All you need to do is visit sharewhatsgood.com to enter! Actually, entering can be as easy as sharing a pic on Twitter or Instagram with the hashtag #sharewhatsgood. How does your family connect around mealtime or at various times throughout the day?